Pelargonium. Pelargonium. Pelargonium. What a lovely and, sadly, underutilized name for an equally lovely plants species more commonly, if not incorrectly, known as “scented geranium.” While related to geraniums, pelargoniums are in a class of their own and the scented cultivars come in a variety of fragrances: mint, rose, lemon, nutmeg, apricot, ginger, and more. Just browse through your local nursery and gently rub the leaves to release the essential oils and determine which ones tickles your fancy, er…nose. The flowers of Orange Fizz are quite beautiful and, when rubbed, the leaves smell even more citrusy and lemony than those of the lemon pelargonium! Note the asymmetrical flowers, a distinguishing characteristic that separates pelargoniums from geraniums. Scented pelargoniums are put to use in recipes both culinary, such as this recipe for Quince Jelly with lemon pelargonium leaves, and cosmetic as in this recipe for Bath Vinegar: 2 oz rosemary, 2 oz rose petals, 2 oz lavender, 2 oz mint, 2 oz rose geranium leaves, 6 cups apple cider or white vinegar, 1 cup rose-water. Mix herbs and flowers together; add vinegar. Bottle and steep in refrigerator for 3-6 weeks. Strain and rebottle. Add a few fresh herb sprigs and the rose-water. Or, just crush a few leaves and add to a hot steeping bath! 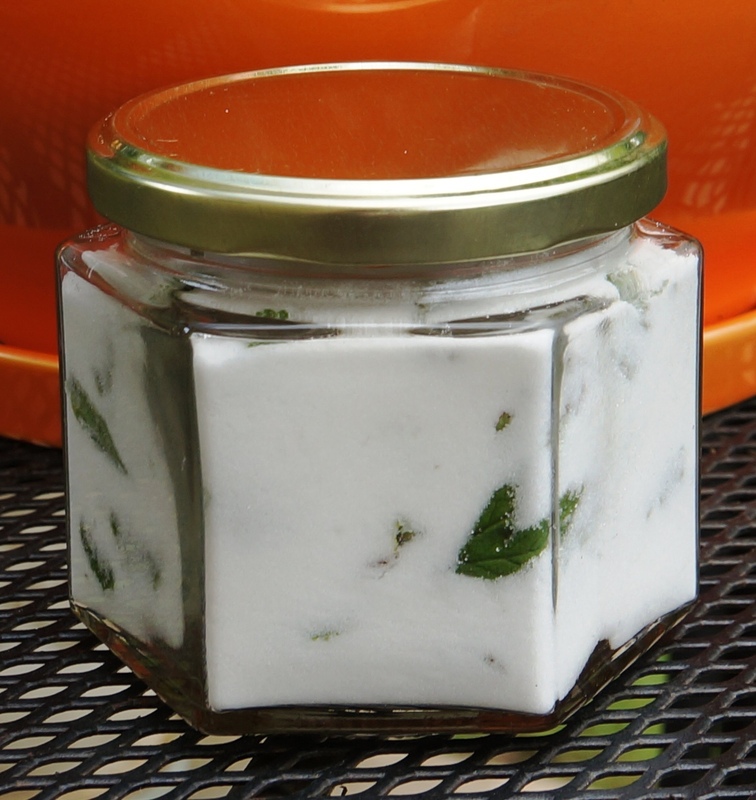 For a delightfully easy flavored and scented sugar to enhance teas and recipes, layer your choice of clean, scented pelargonium leaves between layers of sugar and store in an airtight jar for a week before using. I used the finer castor sugar with two complimentary pelargonium varieties, Lemon and Orange Fizz. Heavenly! Layer scented pelargonium leaves and sugar to add flavor and fragrance to your teas and recipes. Another easy use is to add a few scented leaves to the end of a drier cycle when clothes are hot and the leaves can tumble and transfer their fragrance. I think the Victorians had the right idea, however, by lining walkways with scented pelargoniums and herbs such as lavender so that when full skirts brushed by, essential oils would be released into the air, imparting their heady fragrance to passersby. 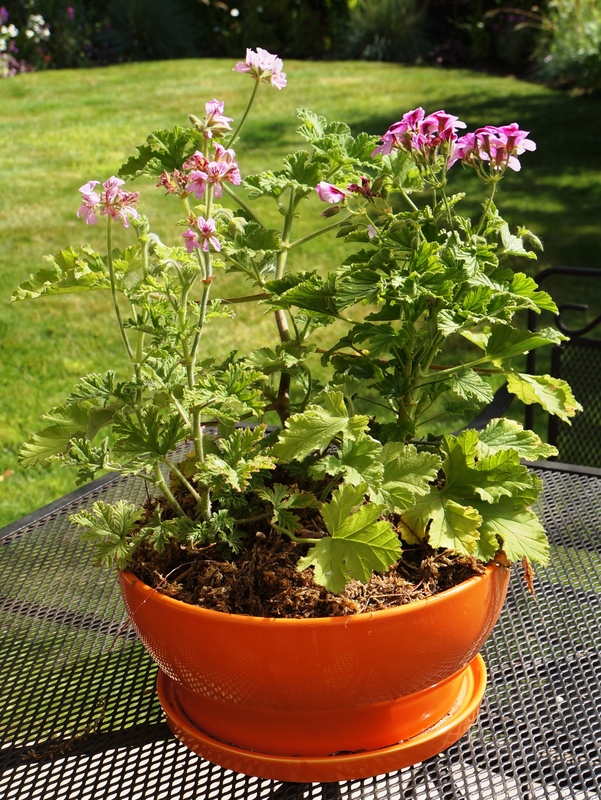 And while today’s hemlines don’t accommodate such a romantic notion, what could be easier than to plant of pot of your favorite pelargoniums on a patio table so that you can absentmindedly touch their leaves and smell their hidden gifts on a sunny, daydreamy day? A Pot o’ Pelargoniums. Left to right: Lemon, Rose Geranium, and Orange Fizz. Flowers True geraniums, known as cranesbill in reference to the shape of their fruit, have symmetrical flowers with ten fertile stamens. Pelargoniums, on the other hand, have bilaterally symmetrical flowers with up to seven of the ten stamens fertile. Seeds Geraniums fling their seeds away while Pelargonium seeds float away on the breeze and usually have a ‘feathered ‘ end that Geraniums don’t have. Perennial vs. Annual Pelargoniums are tender perennials, usually planted as annuals, and occur naturally almost entirely within South Africa. Geraniums are perennials that come back each year. Leaves Those of true geraniums are usually deeply divided and cut while those of most groups of pelargoniums are not. Scented pelargoniums are the exception, with leaves that are often deeply dissected and pubescent (fuzzy) which helps them to beat the heat. Growth Habit Pelargoniums have rather thick, succulent stems, originating as they do from typically more mounding in form with many slender stems arising from a central core, and fibrous roots. I am a Pelargonium–it truly is my name. 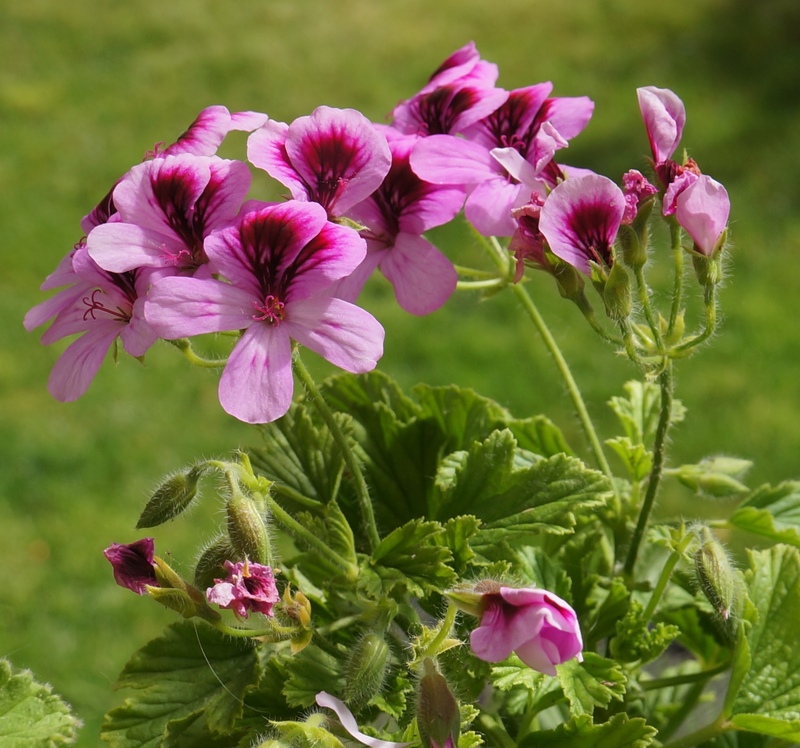 Please don’t call me geranium–it’s really not the same. with flowers that are zygomorphic (this seems to be known by few). to entice the bees to my flower as this ensures my future. my ability to hybridize has been impossible to resist. creating lovely hybrids–those ones you must collect. namely regal, zonal, ivy and angel but there are also many more. I am a Pelargonium! Please use this name for me. 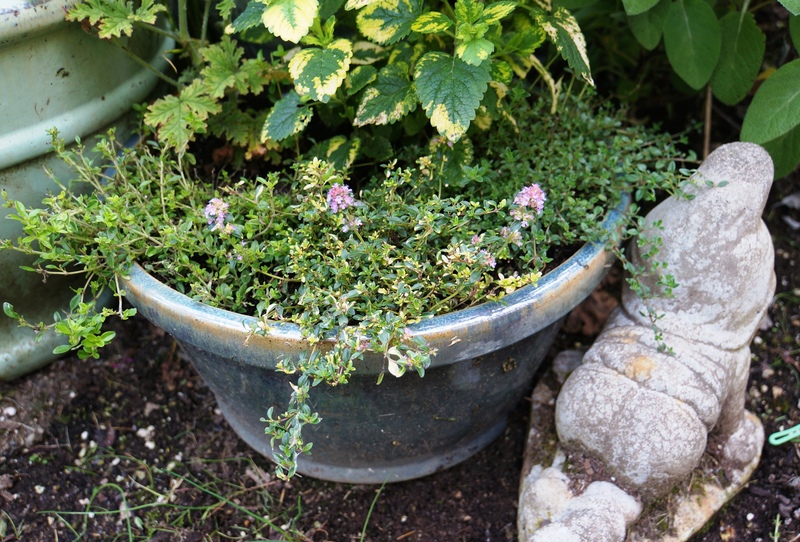 A pot o’ thyme. From left to right: Lime Thyme with bright green leaves, Doone Valley Thyme with lemon scented foliage, and the tender perennial Lemon Curd Thyme. Variegated Lemon Balm adds height and brightens up a shady nook…shade helps this showy balm keep it’s two-toned variegation more stable. The delicate leaves and flowers of citrus thymes are often recommended for baked fish and poultry, in marinades, on grilled vegetables, and in fruit and lettuce salads. Theywork well with custards and flans, too. Did you know that thyme also contains a fragrant oil, thymol, that repels aphids and moths and so are beneficial grown next to plants plagued by these insects? While slugs are apparently resistant to thymol, it is possible to keep them out with pet safe slug baits. And, for those herb munching bunnies and puppies who find the soft loamy soil in my herb garden irresistible for digging, I use colorful rubber coated wire fences. I chose bright green (barely visible to the right in the above photo) to blend in but there are a rainbow of colors to choose from now and they can serve as a playful accent to your garden. 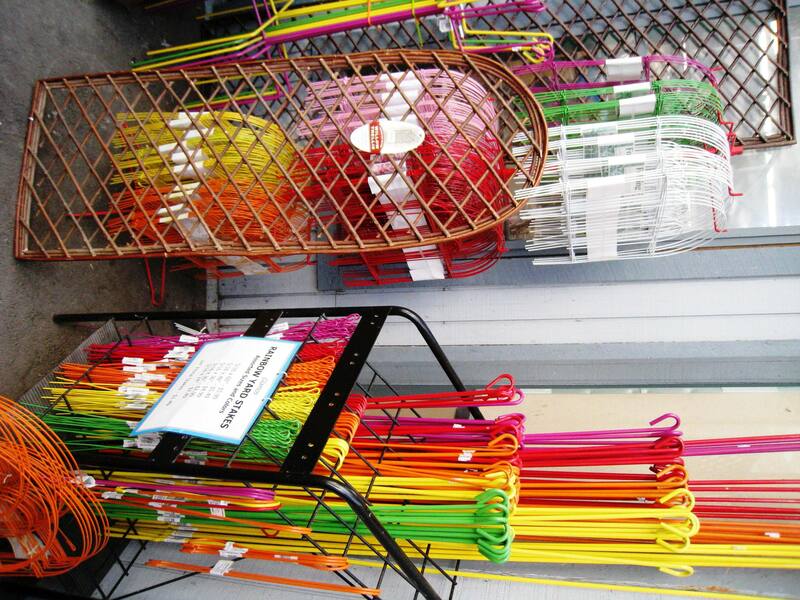 A rainbow of stakes and fences. Just what every garden nome needs. So, what’s growing in your herb garden? Do you have a favorite type of thyme? Or perhaps a thymely or balmy recipe to share? This summer, don’t forget to stop and smell the herbs…and nibble on a leaf or two while you’re at it. I’ve always been happy, and proud, of my home. It has been a labor of love, a matter of pride that I bought it and decorated it completely on my own. For ten solid years, I have had no desire to move or live anywhere else. Until last Friday night. I’ve never cared before that I don’t have all the upgrades. I’ve been in many beautiful, larger, finer homes and have never felt less satisfied with mine upon returning home. But something about the fact that this women, living a similar lifestyle, in a similar neighborhood, and with comparable square footage, also enjoys black quartz countertops with flecks of mica that light up like stars, stainless steel appliances, mahogany cabinetry and wood floors, contemporary porcelain sinks, expansive windows (and that was just the downstairs), gave me pause for the first time. Suddenly, I became aware that her home makes mine scream “entry-level!” I know I am lucky to be where I am, I know it’s not healthy to covet, but there you have it. I’m in a little kind of funk. 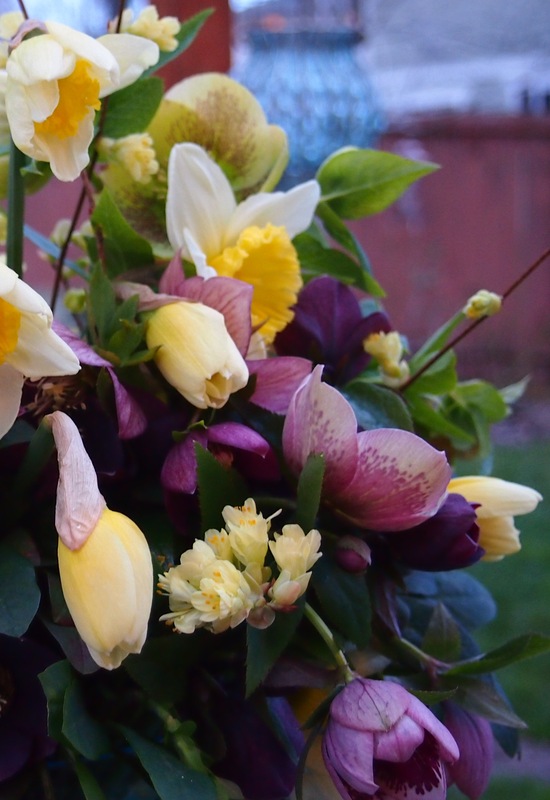 Helleborus, daffodils, and Winter Hazel from the garden. In bloom now. Well, at the same time these thoughts and feelings have been rising to the surface , I have been wanting to post about what’s in bloom now in my absolute favorite shade of yellow for the garden: lemon chiffon. You may remember from my Which Hazel is for You? post that I am not a fan of the bright yellow forsythia color, but I do love the soft yellow of Winter Hazel and the 100 daffodil bulb blooms that I planted last fall and am now seeing for the first time. I suppose I could have just skipped to the chase and featured those blooms and those blooms alone, but I couldn’t help but want to write about all that went with getting to the point of harvesting them on a Sunday evening after a beautiful sunny, but somewhat perplexing day. Winter Hazel blooms, buttery yellow in a cup. So, while allowing myself the luxury, er, necessity, of doing what I’ve always loved: working in the yard and pruning (great therapy) and making beautiful bouquets (reaping the rewards) to share with the office tomorrow (bringing joy to the world), I also weed out those pesky little white flower clumps and purple clusters of leaves that mimic every other new plant so well, before they can seed and choke out the plants that I want to grow. And while I weed, I sort through thoughts. 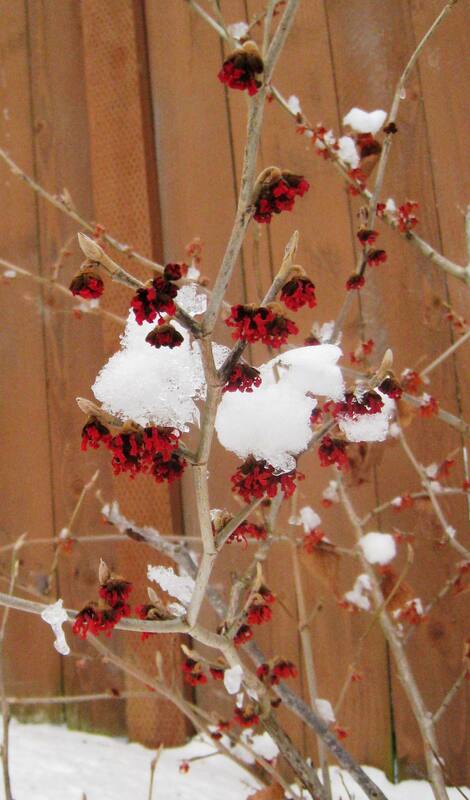 Then, I cut back the roses, hydrangea branches, old perennial seed stalks, and overgrown Mid-Winter Fire Dogwood. I prune the winter-burned leaves and branches of the Razzle-Dazzle Chinese Witch Hazel, and finally rake all the debris and add it to the compost. I take a break to make my son gourmet gouda mac and cheese, steamed asparagus, and brownies. I take a few Ibuprofen for the stiffening lower back. And just before dusk settles in, I focus in on selecting what’s in bloom now for the bouquet. Still, as I cut and arrange, I find myself wondering, “If I move someday soon and downsize the backyard for a few homey upgrades, can I take the prize Messel star magnolia and the Ryan’s weeping Snow Bell trees? Can I have the pots of Razzle-Dazzle Fringe Flower that need winter shelter and tender loving care? And the Winter Hazel whose arching branches of lemon chiffon bells bring me such joy in early spring? Surely no one would miss them with all the other specimens ready to fill their place. 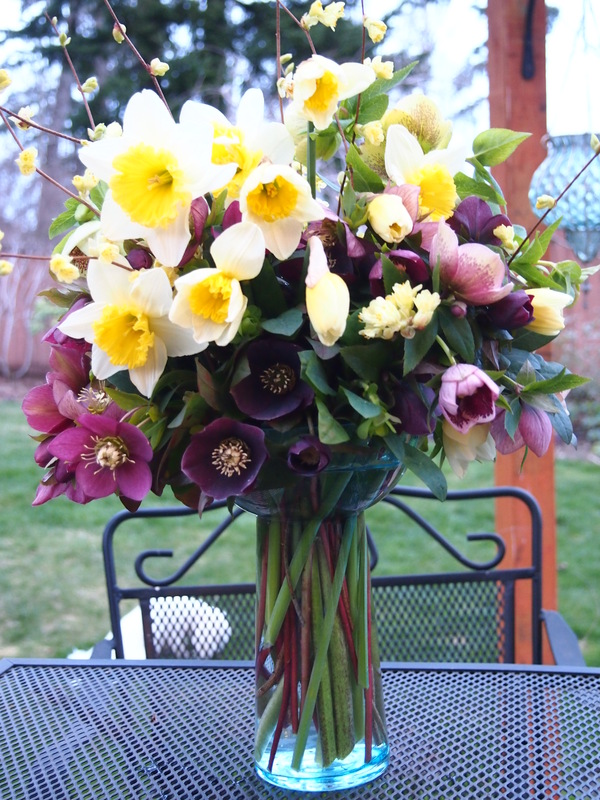 Nothing says spring with more abundance than a bouquet of lemon chiffon Winter Hazel branches, buttery daffodils, Chartreuse Euphorbia heads, and nodding Hellebores Orientalis and Niger blooms in aubergine and eggplant. Perhaps I am entering a new phase, one that will take years to transition into. Noticing my garden friends, enjoying them while I can, but coming to the realization that the sheer amount of upkeep is beginning to infringe upon other things I might want to do with my time and space, both physically and monetarily–like blogging, or travel, or taking pictures, or exploring other forms of creativity. But for now, I hope the flowers I bring to the office tomorrow do bring others a little joy. And I hope the Vitamin D that I absorbed from the sun today kicks in real soon! A boquet from my garden. Note: the daffodils appear a little overexposed. Their petals are very pale yellow like the buds and centers are medium yellow. Soft and lovely. Which Hazel is Right for You? 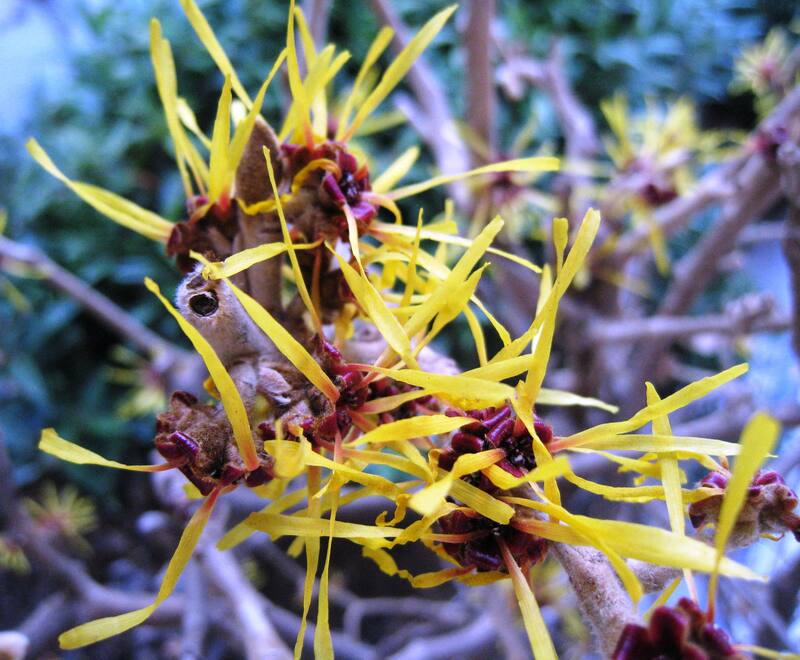 The scent of these thread-like witch hazel flowers wafts through the parking lot in front of TJ Maxx each winter! Just fully opened, the fiery yarn-like tufts of Hamamelis x intermedia ‘Diane’ are less fragrant than its yellow cousin, and smell faintly of orange spice. Older, orange and yellow blooms in the background make for a multi-colored sunset hued shrub. 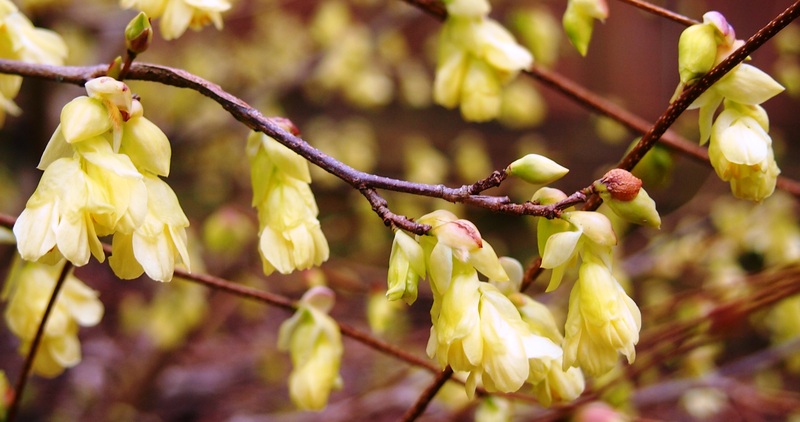 If you like bright lemon yellow floral tones though, and have a spot near a door or a drive so so you can be greeted by the heady fragrance, consider this open vase-shape shrub as an alternative to the more common forsythia. Lucky for me, I get to enjoy the fragrance quite often, as these witch hazels are graciously planted in large raised concrete encased beds in front of one of my favorite stores to browse through, TJ Maxx. Although the intoxicating scent is tempting, I prefer a lemony or light butter yellow for shrub flowers. I also don’t love the way the leaves hold on in the winter, but that is easily remedied by plucking them off when the blooms appear so they can show off the ribbony rays of sunshine. The intoxicating fragrance of a prolifically blooming Hamamelis vernalis greets passers by. There are several varieties of Witch Hazel and I was curious as to what else is out there so next I stopped by my local nursery, sure that they would have an abundant of species as in year’s past. 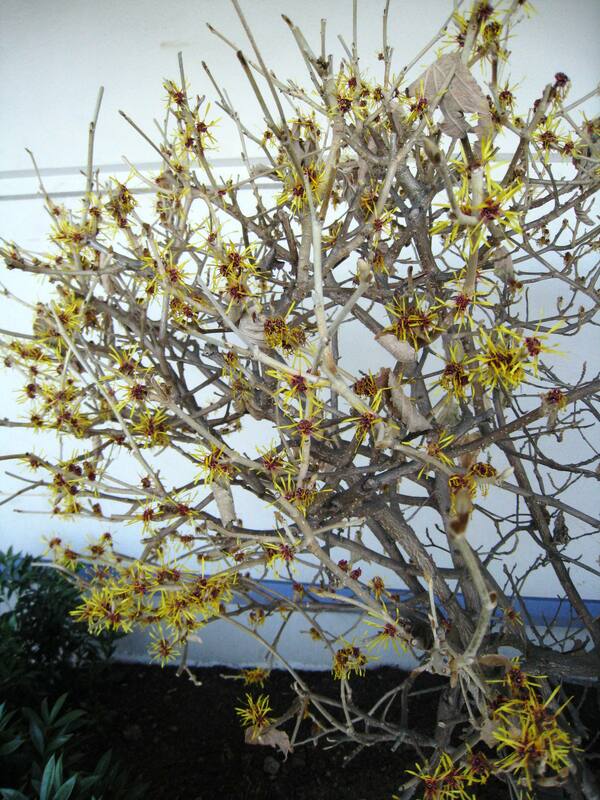 Witch hazels have been in bloom for two to three months though and all the shrub varieties are now sold out, further evidence that the witch hazel often falls into the hands of gardeners eager to lift their spirits during the low-light days of January and February. 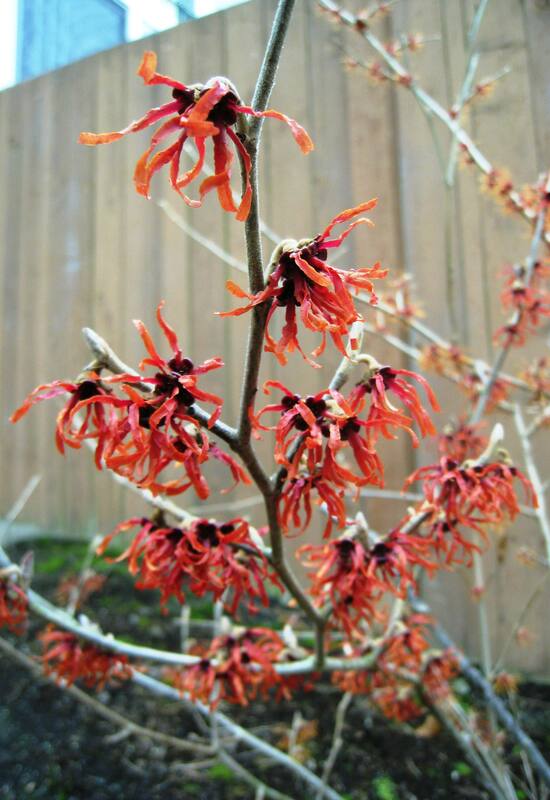 My nursery did have three specimens left of Hamamelis x intermedia ‘Arnold’s Promise,” grafted as a tree. While witch hazels are often used as understory plants, the tables turn in this case. Here, clusters of Arnold’s finely shredded yellow petals light up in the afternoon sun and are echoed in the yellow stamens of an evergreen pink flower camellia below. Arnold Promise Witch Hazel tree with Pink Camellia understory. Now for the pièce de résistance, not that I am biased or anything, allow me to share the witch hazel which I chose for my garden, Hamamelis x intermedia ‘Diane.’ Witch Hazel ‘Diane’ is a showpiece in and of itself. One of the things I love about Diane, is that her firecracker blooms unfurl in various states and stages, so that the effect is one of delicate streamers of lemon, blood orange, grapefruit pink, and tangerine all on the same, bare-branched shrub. Even though Diane is planted in my front yard, she is set in a side garden a little further back against a cedar wood fence. I have to remind myself to visit her, crushing a few of her stringy petals between my fingers to release their citrusy-spice scent. If I forget her, however, and if the timing is right after a hard day’s work, Diane will make me catch my breath as a burning bush in the amber rays of a low winter sun set it alight, reminding me that their is life after work! Diane does not rest on its laurels, er…hazels, once its blooms are spent, however. It also has attractive wine-colored bracts and maroon fall tones. Newly opened blooms of Diane's Witch hazel are blood orange in color and make a lovely contrast to the first snow. Follow a regular watering schedule during the first growing season to establish a deep, extensive root system. Watering can be reduced after establishment. Feed with a general purpose fertilizer before new growth begins in spring. Pruning time: winter. Fading into the sunset, blooms of Diane Witch Hazel become more variegated as they get older and stand alongside younger blooms, offering a variety of color on the same bush. Witch hazel is an exceptional large native shrub for northern homesites. A perfect choice for breaking up long boundaries and fence lines. Makes unusual seasonal interest in out of the way walls of foundation planting. A real problem solver as understory beneath aged old shade trees. Naturally adapted to compositions of mixed woodlands of evergreens and deciduous forest trees. Let it go native in wild gardens among natives, grouped with other species from indigenous plant communities. Exceptionally valuable for transition zones separating cultivated landscapes from undisturbed wildlands. 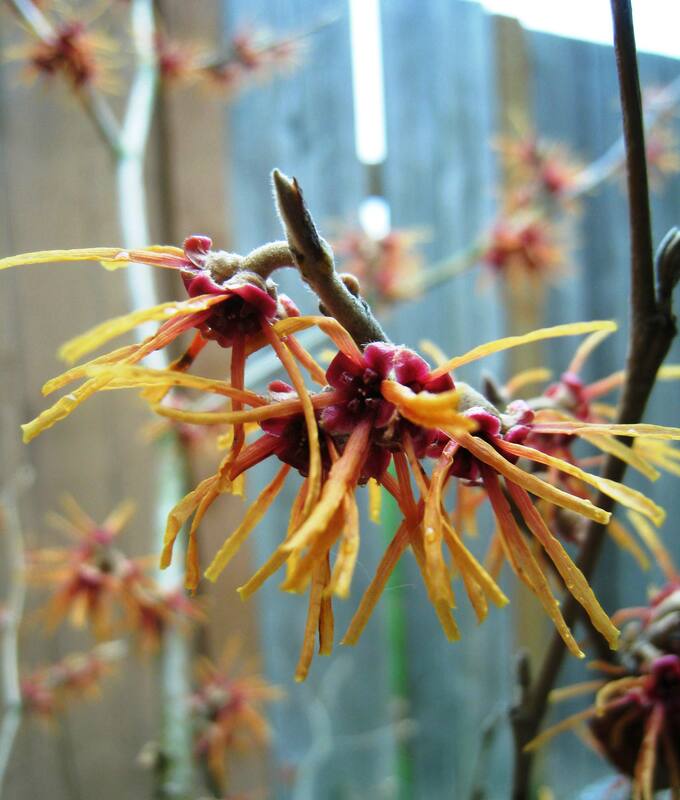 The witch hazel is one of the first winter bloomers.